At last a BAFTA worthy UK home grown British film that will enlighten and educate people in an entertaining way about the many reasons why avoiding meat and dairy is such a good idea for health and the environment. It's got Chad Sarno talking about food so it immediately gets my vote. Be great to see this win an award BAFTA or otherwise - it's one of the most important issues to put on television. 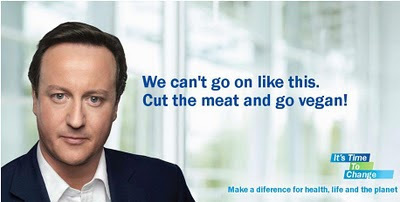 David Cameron's new poster for power is ever so slightly unbelievable. Clearly he is on the hunt for every vote but will anyone believe him? Sadly there is a new generation of voters who were barely born when the last conservative government caused riots and homeless people in their hoards on the streets. A HAND - BAG? A vegan HAND BAG? 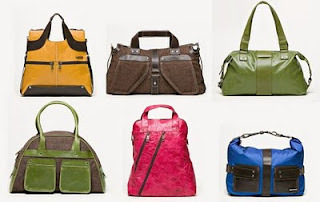 A stylish, utterly exquisite looking, luxury, ethical, vegan HANDBAG? When he was 18 years old, Inder Bedi was challenged to forego animal products for thirty days. Upon graduating university, Inder set out to create an accessories brand that, although vegan, was first and foremost beautiful, understanding that the two could co-exist. Now thirteen years later, he sits at the helm of one of Canada's premier accessory brands, MATT & NAT, garnering international recognition, and the originator of vegan luxury. Samsara is his latest venture: a collection of vegan accessories with the intention to affect change both locally and globally. For every bag sold, ONE DOLLAR is donated to a non-profit organization of your choice. That means that every bag found on any shelf across Canada represents one dollar that will be donated at the end of the season.